New Delhi: Union Finance Minister Arun Jaitley today said “freedom of expression and nationalism do necessarily co-exist”. He also went on to emphasising that Constitution gives full freedom to express dissent but not the country’s destruction. Jaitley was briefing the media on the political resolution adopted at its National Executive meeting here on Saturday. Jaitely’s assertion is significant as it comes in the wake of the controversy generated by a number of political parties, including Congress and a section of the media and a number of so-called intellectuals who went into the overdrive by supporting those students from Jawaharlal Nehru University in New Delhi, who had organised an event on February 9 this year, to commemorate Afzal Guru, who was hanged due to his involvement in the terrorist attack on Parliament. A couple of these students were also arrested and charged for sedition. They are now out on bail. The February 9 JNU event had shocked the nation as many of those present there had even shouted slogans to destroy India. BJP President Amit Shah had also taken a strong posture at the BJP meet. In his inaugural address, he said in categorical terms that BJP will not tolerate any attack on the nation. Jaitley said through their resolution, the BJP has reiterated its commitment to the ‘agenda of governance’ but at the same time clarified that issues like formation of government in Uttarakhand and Jammu and Kashmir did not figure in discussions at BJP’s national Executive meeting. “There was a time when the country was being governed without any sense of direction. There was uncertainty and lack of purpose. 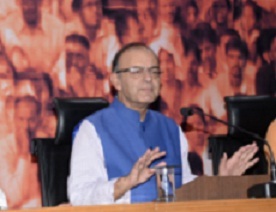 Now we have a government with a determined leadership, nationalist policies and progressive governance,” Jaitley said.